NBR spoke with Joanna Lewis (Georgetown University) to understand the complexities of China’s wind energy industry and the challenges facing the diversification of energy production. Today, China accounts for approximately one-third of globally installed wind power. Despite the vast amount of wind energy available and the national commitment to combat climate change, a substantial portion of the nation’s wind farms are not connected to the grid or are used on a limited basis. This gap between wind’s potential and its actual utilization in China’s energy mix has sparked discussions on the outlook for this resource. NBR spoke with Joanna Lewis (Georgetown University) to understand the complexities of China’s wind energy industry and the challenges facing the diversification of energy production. Over the past few years, China has prioritized revolutionizing its energy mix. At the Conference of Parties in Paris in 2015, China pledged to reduce its national carbon dioxide (CO2) emissions per unit of GDP by 60%–65% of 2005 levels by 2030. How does the government’s vision for wind energy fit into this goal? Promoting renewable energy is a key part of China’s decarbonization strategy. In Paris, China also pledged to peak its CO2 emissions before 2030, which requires reducing its reliance on coal and increasing its use of non-fossil energy sources. China’s promotion of wind power aligns well with key national priorities—namely meeting growing energy demand, reducing air pollution, and developing new high-tech industries. The push to develop non-fossil sources of energy is enshrined in the most recent five-year plans. The 12th five-year plan included a target to increase non-fossil energy sources (including hydro, nuclear, and renewable energy) from around 8.3% of total energy use in 2010 to 11.4% by 2015. This goal has been achieved and was increased to 15% by 2020 in the 13th five-year plan. China’s nationally determined contribution submitted in advance of the Paris Agreement extends the non-fossil energy target to 20% by 2030, reaching into the next two five-year plan periods. Wind has been one of the fastest-growing energy sources in China, which now has the largest installed wind power capacity of any country in the world. China is also home to top global wind turbine manufacturers and makes around half of the world’s wind turbines. Some have argued that “the wind is wasted” in China. Can you elaborate on what this phrase means, and what factors have contributed to this phenomenon? 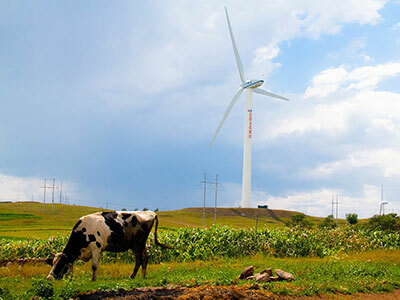 While wind power has been growing quite rapidly over the last decade in China, the industry is facing serious obstacles. The biggest challenge is integration: making sure the power being produced by wind farms is absorbed by the grid and consumed. Widespread curtailment of wind power has affected the growth of the industry. While wind power curtailment is in part a technical issue that may result from insufficient peak capacity, distribution congestion, or limits on transmission capacity, in China political and institutional factors increasingly play an even larger role. Curtailment in China is partly due to the incentive structure created by fragmented transmission authorities and local taxation structures, as well as the way electricity is priced in a still predominately state-controlled power sector. National curtailment rates have been increasing for the past few years, with the National Energy Administration reporting a record rate of 19% in the first three quarters of 2016. China’s wind energy growth over the past decade has been extremely impressive, particularly considering many of the challenges the country faces in this sector. Much of the country has mediocre wind energy resources, and the geographic distribution of these resources is not well matched with where demand is located. Wind power technology that has primarily been domestically developed has been operating for a shorter time than that of other countries. In many cases China is still struggling to catch up to the technological performance of comparable technology made by other countries. In addition, project siting for wind farms has frequently been inefficient, resulting in lower capacity factors. Inexperienced operation and maintenance and poor forecasting only increase the number of obstacles to achieving high-performance renewable energy facilities. Despite these challenges facing the wind power sector, growth is still impressive. The share of non-fossil energy in China’s total capacity has increased every year since 2013. When we talk about poor management of the power sector, wind power is not the only energy source discussed. How much of China’s wind integration challenges are due to broader structural issues within the power sector? As a nonmarket economy, China has established a power sector that struggles with numerous levels of inefficiency. These include inefficiencies in setting electricity prices and distributing subsidies. In addition, the power sector comprises many legacy firms that are state-owned and influential political and economic actors in China. The primary state-owned power-generation companies all have been involved to some degree in renewable energy project development, but the two state-owned grid companies have been somewhat less supportive. One key challenge to renewable energy integration in China is the lack of an interconnected national power grid. China’s power system consists of six regional grids with weak interconnections. While there is some trading across regions, the grid is not well designed for cross-regional balancing. Also relevant when considering the potential for renewable energy development on the current grid is the extent to which there is excess installed capacity. For example, northeastern China’s installed capacity is over double its peak load. In contrast, the installed capacity of northern China, including western Inner Mongolia, is much closer to its peak load, as is central and eastern China’s installed capacity. Major overcapacity in the power sector means that everyone is competing to sell electricity when demand is low. The design of China’s power markets makes it very difficult for renewable energy to compete. Thermal power plants are assigned a set number of full-load hours every year, and interprovincial trading volumes are decided usually as far as a year ahead of time. While there are some financial incentives to maximize local production, the variability of renewable sources like wind power interferes with the long-standing practice of allocating full-load hours and trading far in advance. What concrete steps can the Chinese government take to address these challenges? How likely are these steps to occur? There are a variety of steps the government can take to address wind integration challenges, and the good news is that several of these are already in progress. Addressing wind curtailment has been the focus of policies introduced by the government going back to 2011. That year, the National Energy Administration issued eighteen new technical standards targeting curtailment and performance issues in the wind sector. These measures included the “Notice on Strengthening the Management of Wind Power Plant Grid Integration and Operation,” which introduced new grid codes aimed at preventing disruptions from wind turbines, and the “Provisional Management Methods for Wind Power Forecasting,” which required all wind farms to install forecasting systems to better predict power output in advance and help with dispatch planning. The introduction of new grid codes included low-voltage-ride-through capability, which ensures that wind turbines do not disconnect from the grid despite short disruptions in voltage. Overall, grid codes require wind power plants to possess more or less the same operating capability as conventional power plants to ensure the security and reliability of the power system. This has become increasingly critical with the penetration of wind power into the power system. Numerous other policies have been introduced to address the issue of curtailment. In March 2016, China’s National Development and Reform Commission (NDRC) released the “Measures for the Administration of Guaranteed Acquisition of Renewable Energy Power Generation.” This new regulation detailed how renewable energy should be given priority on the grid and required any grid company that restricts generation to compensate the wind farm for the curtailment. In July 2016 the NDRC also issued a notice on the preferential power-generation pilot scheme for renewable energy peak-load units. The regulation states that the majority of renewable energy should be used locally and that interprovincial transfers should be encouraged only when necessary. It also restricts curtailment rates of renewables to less than those of fossil fuels. These measures are all constructive steps. However, it is very concerning that wind curtailment is already affecting the entire wind turbine manufacturing sector, resulting in increased prices for wind turbines after years of price declines from increased learning and manufacturing scale. It is likely that curtailment will remain an issue until broader reforms of the power sector are implemented that change the way that key stakeholders, including power producers and grid companies, are incentivized and compensated. Joanna Lewis is Associate Professor of Science, Technology and International Affairs at Georgetown University’s Edmund A. Walsh School of Foreign Service and a Faculty Affiliate in the China Energy Group at the U.S. Department of Energy’s Lawrence Berkeley National Laboratory. This interview was conducted by Ashley Johnson, a Project Associate at NBR.